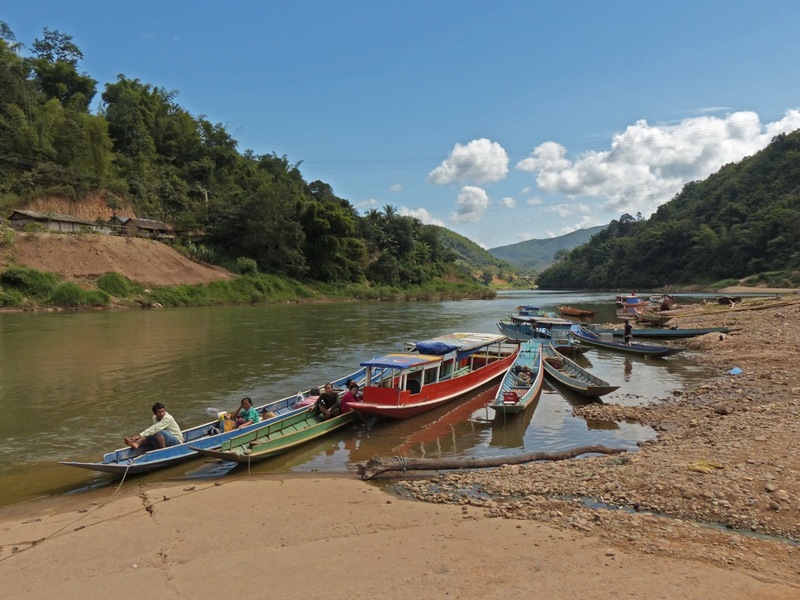 It’s a short walk across the Nong Khiaw bridge to the area where the slow boats leave to go up and down the Nam Ou river. It is mid-November now and the number of tourists that we encounter on a daily basis has increased. So about 20 or 30 of us all lined up. 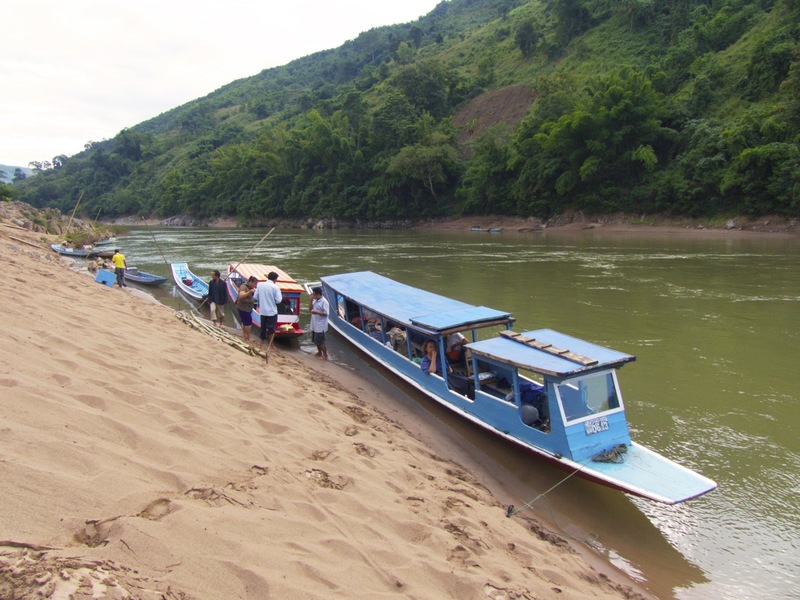 Two full boats headed down river to Luang Prabang (5 hours) and two full boats headed up river to Muang Noi (1.5 hours). Our boat started out with about 16 people on it, mostly foreigners. Not very comfortable as we were packed in very tight and sitting on a skiny wooden bench. All of the foreigners got off the boat in Muang Noi. 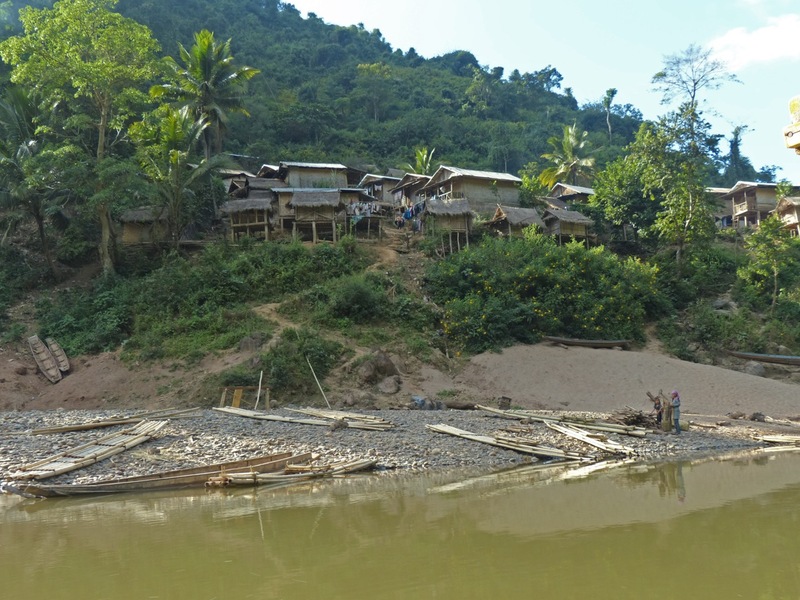 We were the only farang along with many locals going to small villages up the river. 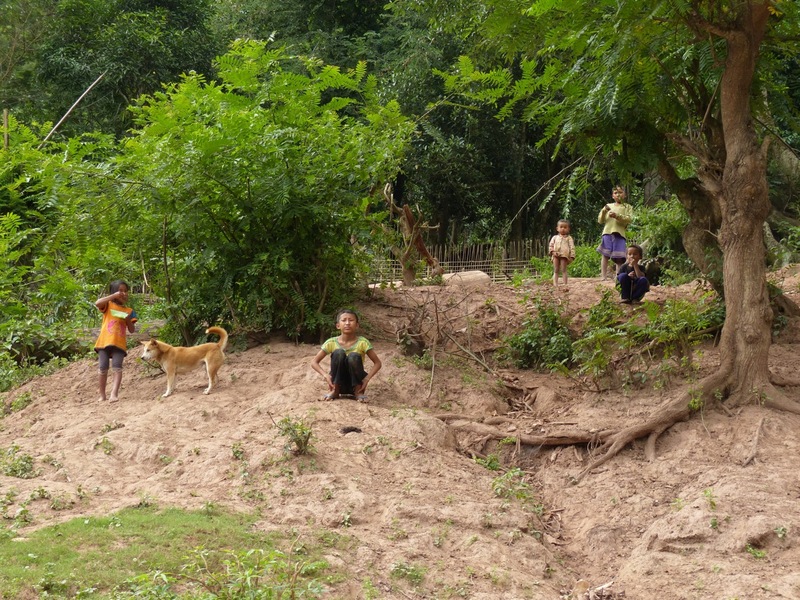 Note about Muang Noi: 6 years ago we went to Muang Noi and Michel took some of his best pictures during the trip there. We could only get there by boat, there was no electricity, a couple of primitive guesthouses, and a small dirt road for walking through town. All who lived there were in poverty. 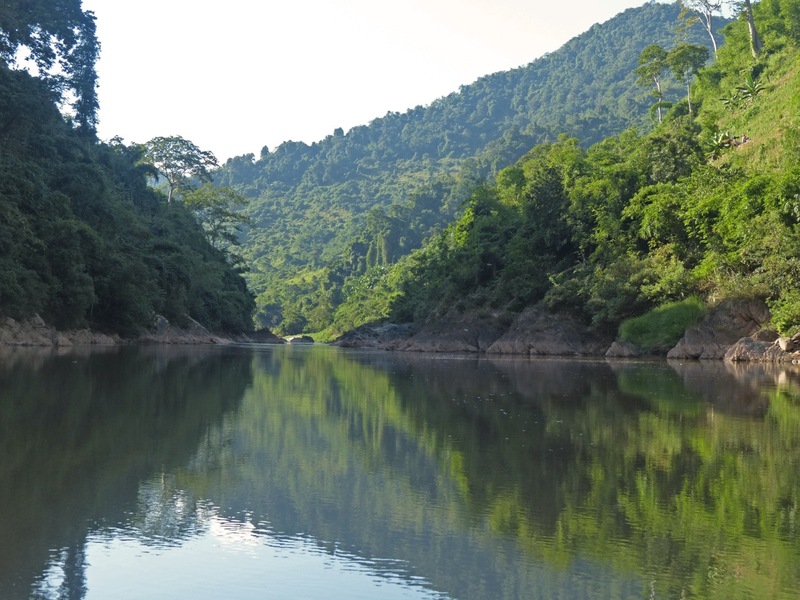 Todays Muang Noi is connected to Nong Khiaw by a new road. 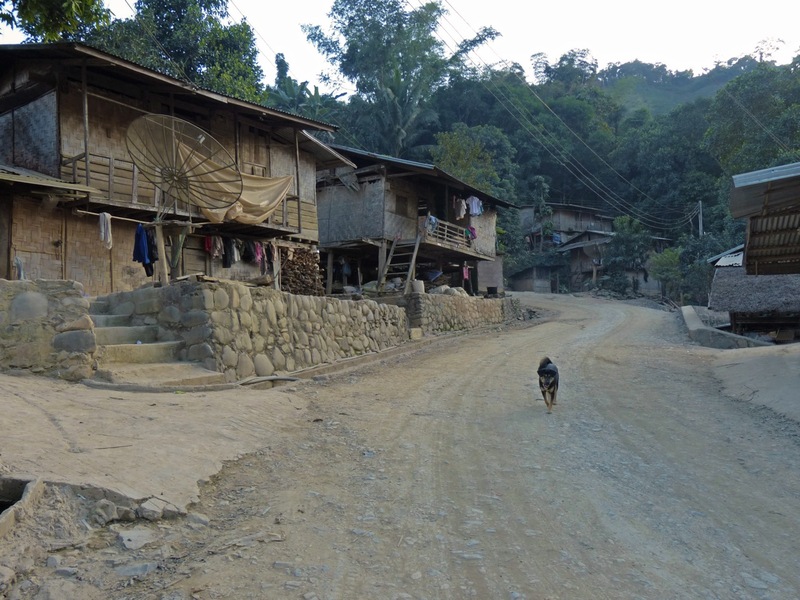 Electricity, running water, and many new guesthouses have come with the new road. We did not stop for long but it looks like the locals are prospering even though they have given up their solitude. The captain gave us wooden chairs to sit on. Much more comfortable then the wooden rail and gives a way to rest your back. Michel and I had brought sandwiches and water which we shared with everyone including the boat captain. He called me “kind farang” but those were the only English words we heard for the rest of the trip. I believe that this day was my favorite day of our entire trip to Asia so far. 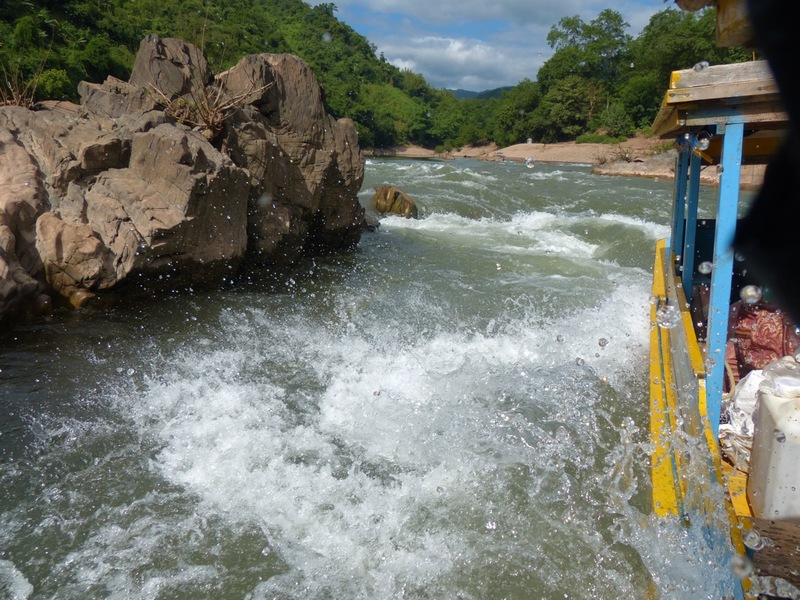 We rafted rapids and sped through calm waters. 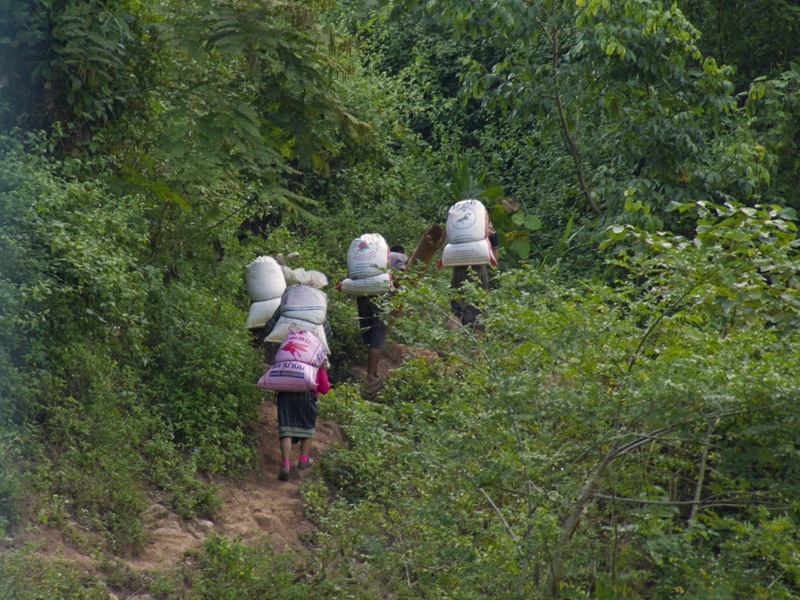 The villages where we stopped to drop off passengers were primitive. During the many stops to pick up and drop off passengers along the way we were able to observe some villages in their daily routines. 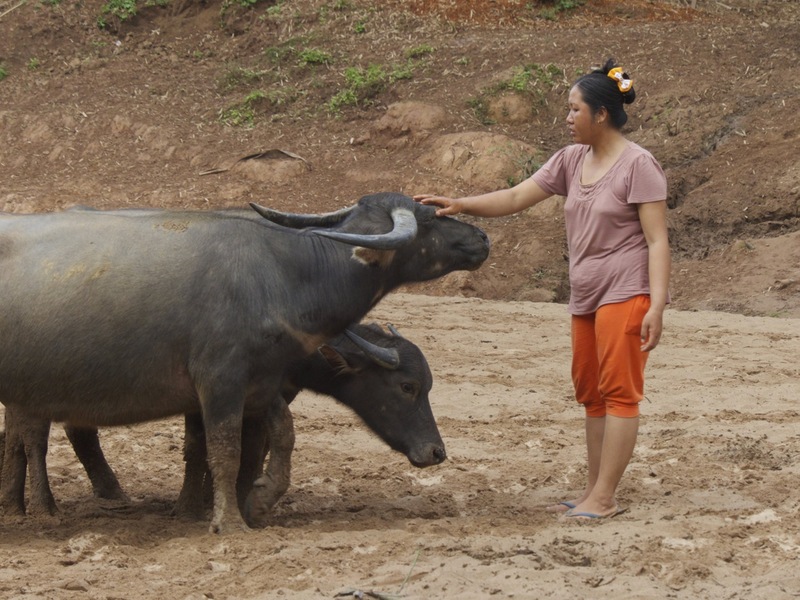 During a ten minute stop at this village we watched this woman spend the entire time working with the water buffalo. She moved very slowly massaging them on the head and the hind quarters. 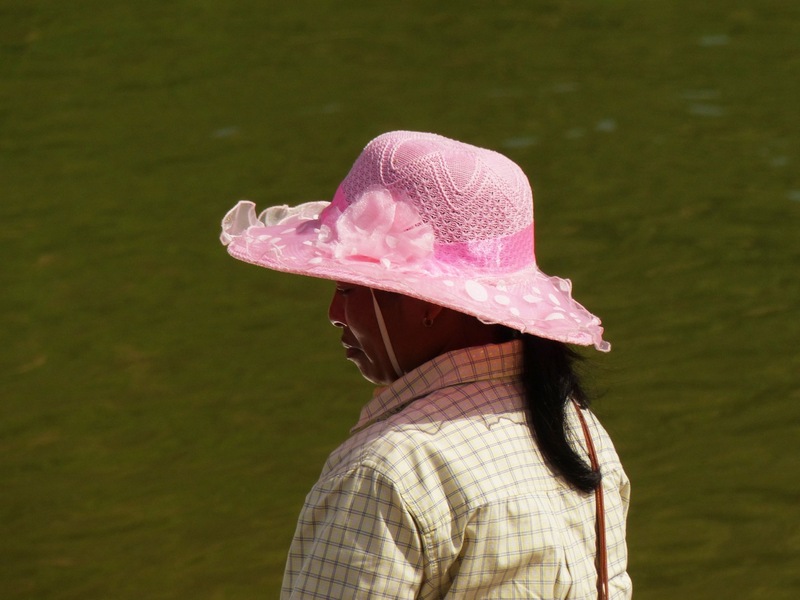 She demonstrated the special relationship the villagers have with their livestock. During the trip there was, for a few hours, a feeling of no past and no future. 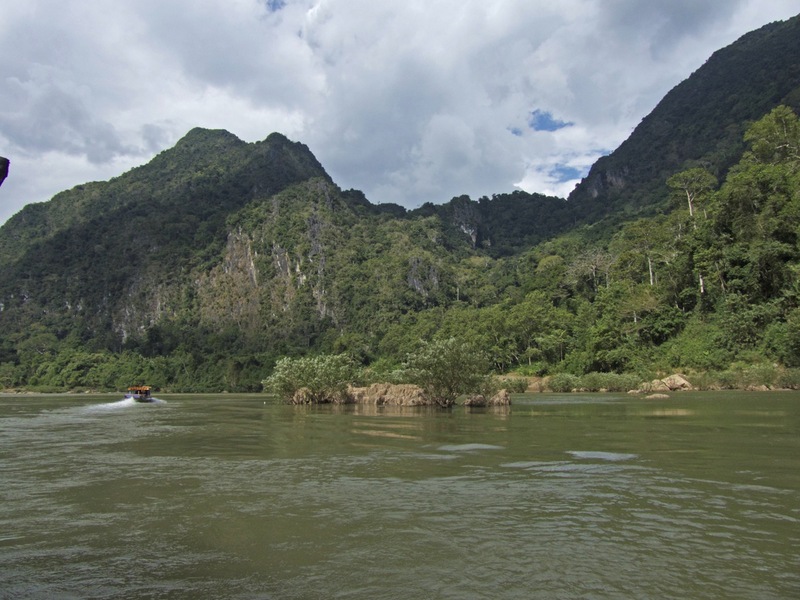 Only the boat, the limestone mountains, and the river rushing by. With quick glimpses of beauty around each bend. It rained three times during the 7 hour trip but each time we put on our rain gear like true sailors. Then when the sun came out again to warm us we were back in our shorts and shirts. As the sun was setting we arrived at Muang Khua. It started to rain again hard as we got off the boat. We put on our packs, walked up the steep hill into town and found food and shelter for the night. 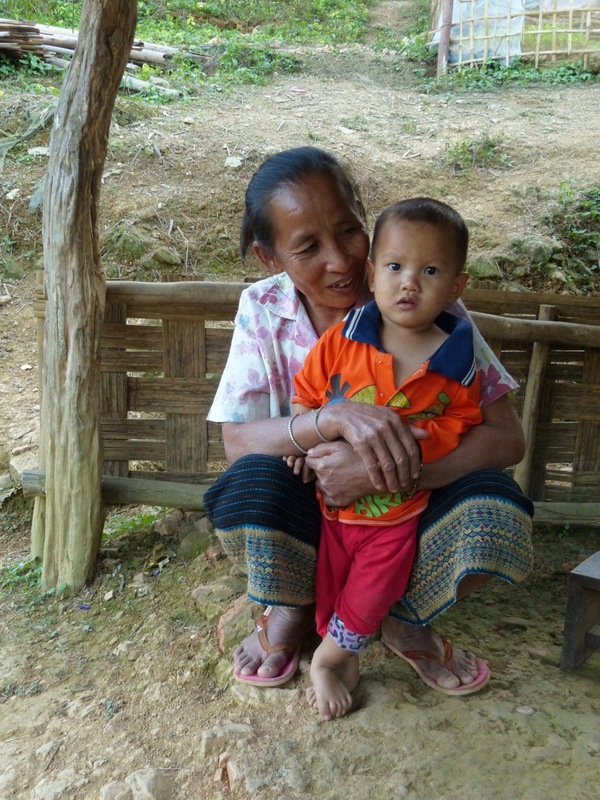 We spent one day in Muang Khua. 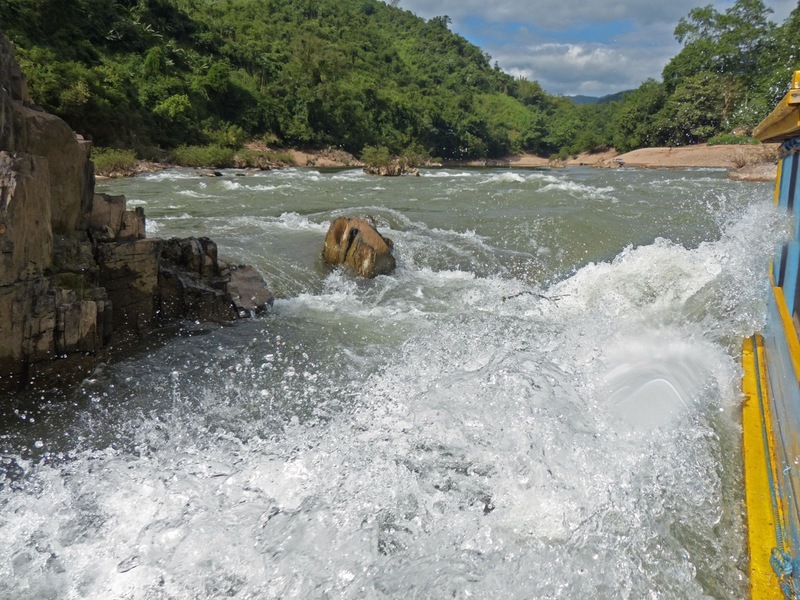 Muang Khua is the small town that many tourists pass through on their way from Vietnam to Luang Prabang. However, this is a very rustic stop. Guesthouses range from down right dirty to sort of clean and basic. 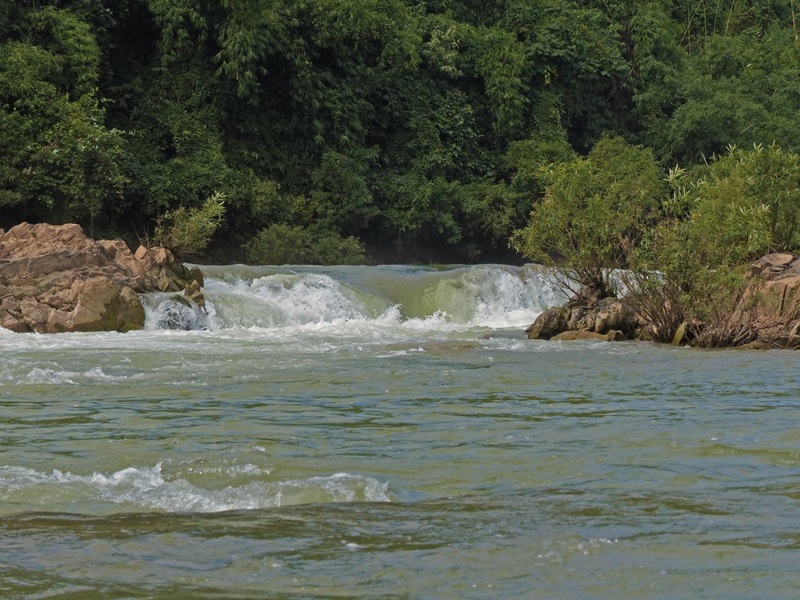 Noise is a problem everywhere in Laos. 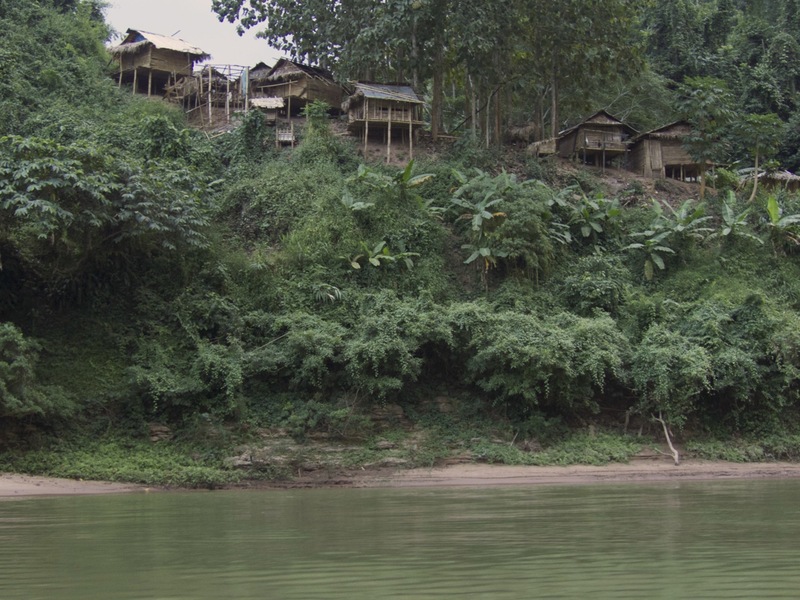 The Laos are completely unaware and turning up multiple large stereo systems full blast at the same time is not unusual. In addition, construction continued next to our guesthouse until about 11pm. So both Michel and I woke up tired after a restless night. The temperatures were beginning to cool as we moved north and I finally changed from shorts to jeans. During the day we wandered all over town which did not take long. We had noodle soup and Laos coffee at a small restaurant at the cross roads of the two streets. Most activity seemed to be around the boat landing. 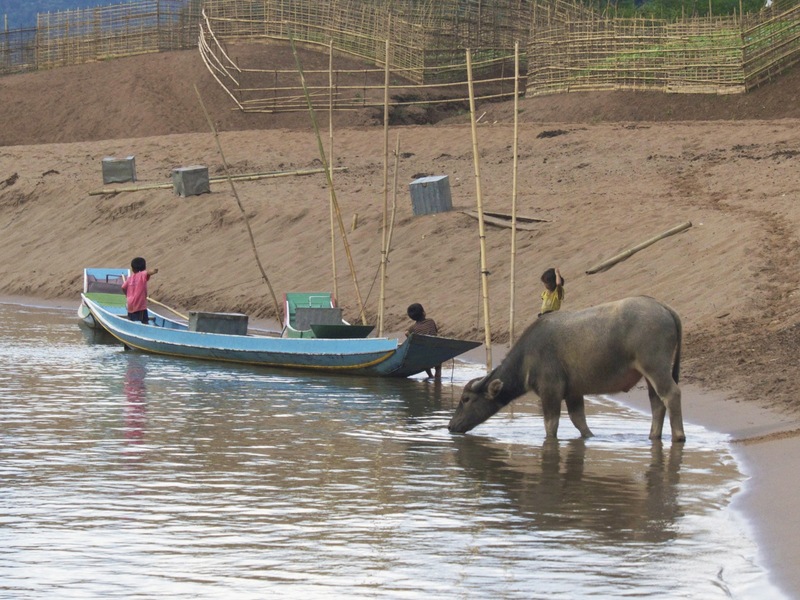 The locals were butchering a steer and a pig next to the water. They were catching and selling fish. We watched four locals weigh and then sell a pig. 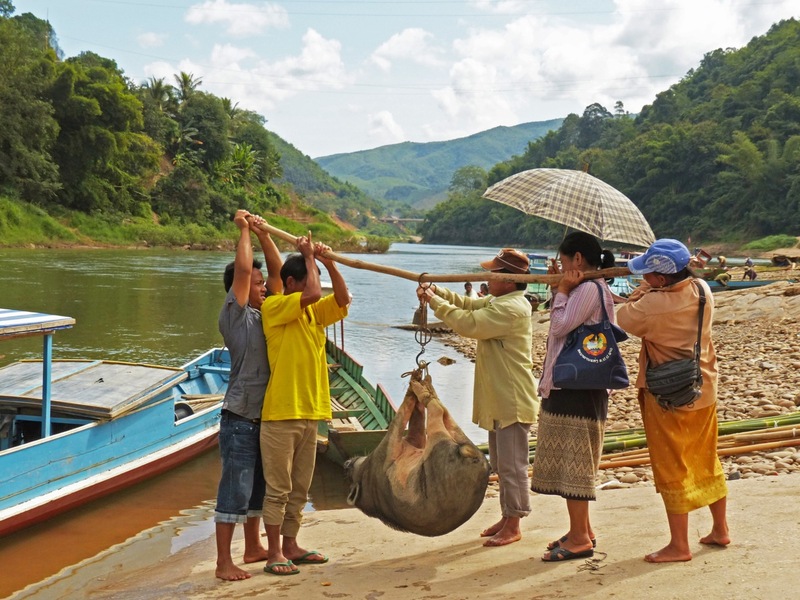 The pig was loaded on a boat and taken away still in shock after being lifted by his ankles. Life is very simple here but there are signs of prosperity. There are new buildings shooting up everywhere. That night we tried a new guesthouse but we were housed on the same floor as about 20 people (Asian origin) who made lots of noise late into the night and got up at 6:30 in the morning. Michel was really frustrated this time and went out to tell them to be quiet (in French). I am sure they did not understand or did not care what he was saying. Just another crazy Farang :). We had a quick soup and went down to the docks to catch our second boat. Other boats left going down stream jam packed with tourists. I don’t think we’ll have the boat to ourselves when we go back. 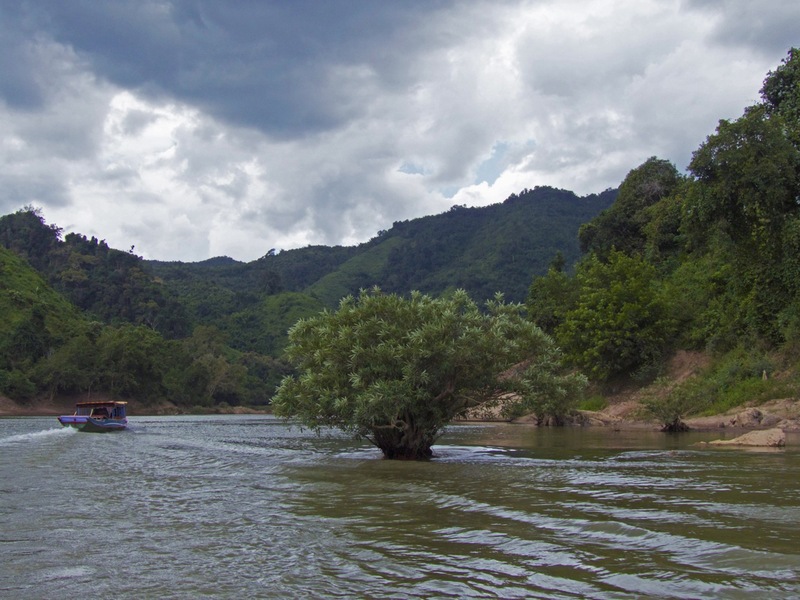 On this, the third day since Nong Khiaw, we caught the slow boat to Hat Sa. This trip was 6 hours and we were, again, the only farang on board. 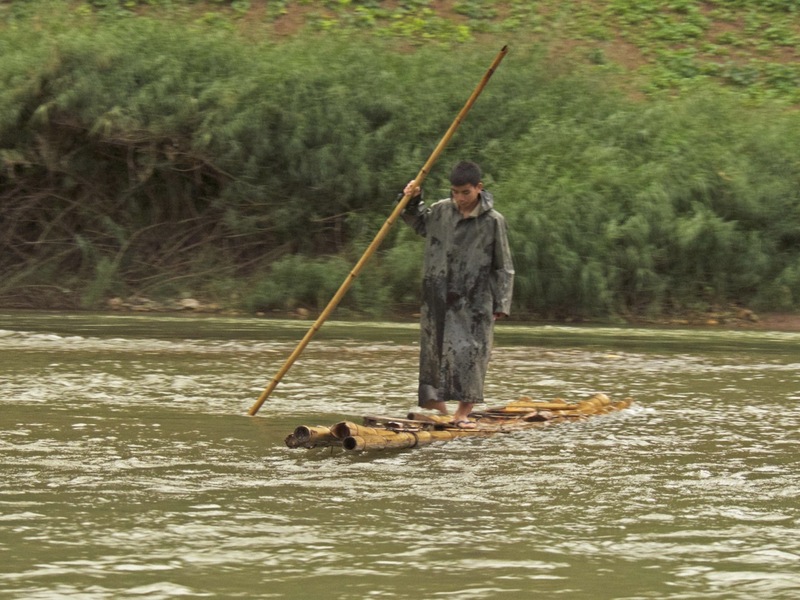 In addition to a few locals the boat was completely loaded down with Laolao, the local whiskey. We estimate about twenty 40 liter containers. The boat waterline rail was completely under water. We slowly motored up stream. The tall limestone hills were gone now replaced by smaller jungle covered hills. We had learned our lessons from the day before and brought our rain gear and seat cushions. One of the most precious and necessary items that we brought on our trip were sheets. Michel’s sheet being extra special as it was a gift from the Hilton hotel I lived in last year. Many hotels in Asia do not provide a top sheet and in some cases are dirty enough that you are happy to have your own sheet. Place your sheet inside a waterproof vacuum bag and voila you have a seat cushion. They say when you travel it is not the destination but the journey. We loved our journey up the river. We were completely entertained by everything passing by and during those hours on the boat Michel and I agree that this part of the adventure is surely as great as everything we could have dreamed. We rode bigger rapids this time. With all of the weight in the boat we were soaked each time. We passed even more remote villages. As the boat passed by each village people came down to the shore to watch us. 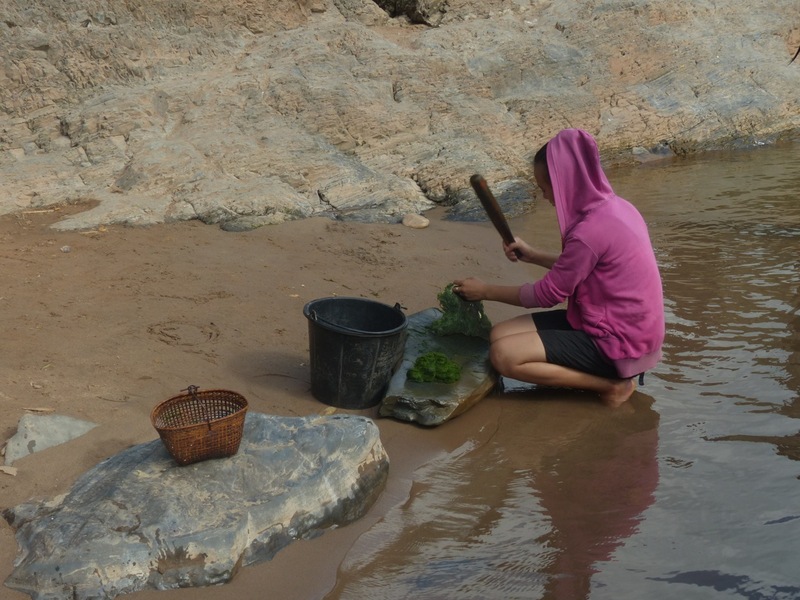 We passed one village where this woman was preparing river type seaweed. It is beaten and then cooked. Tastes very good served dry with Beer Lao. 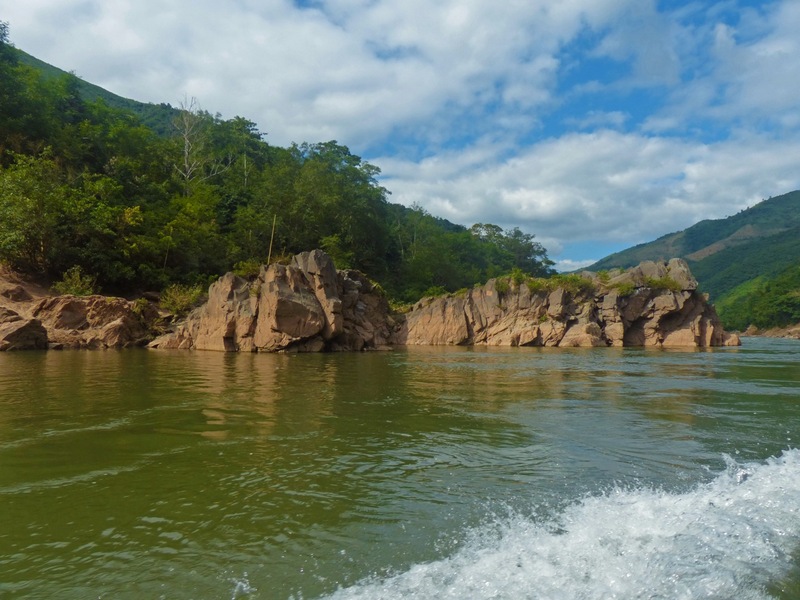 The only blights on the beauty of our trips were the dam and the gold mining. 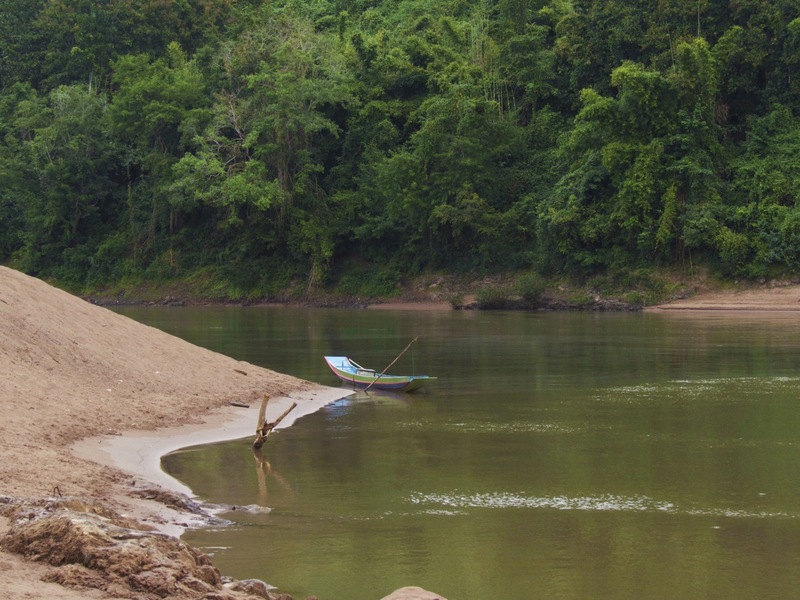 Laos is exploiting it’s rivers to build dams and generate electricity that can be sold to Thailand. Electricity is very expensive there. 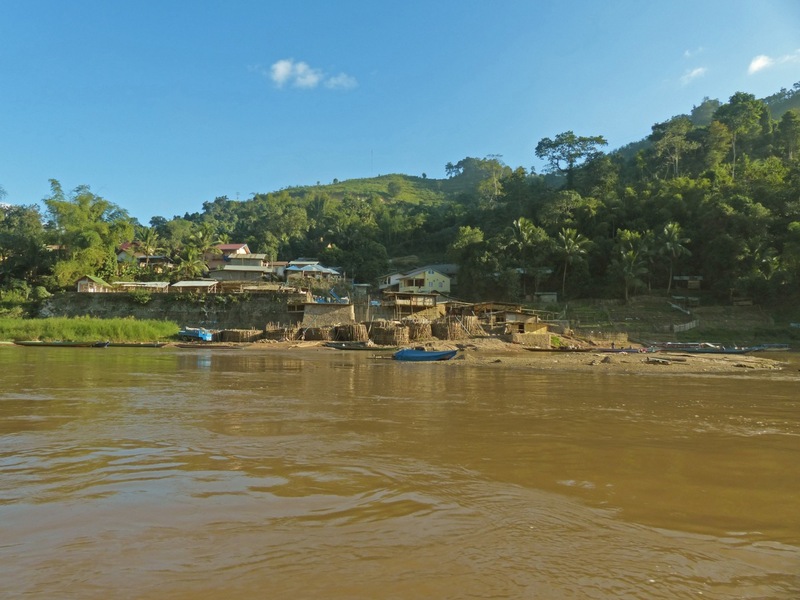 Tourists going up the river to Hat Sa are enjoying some of the last opportunities to see this part of the river by boat. 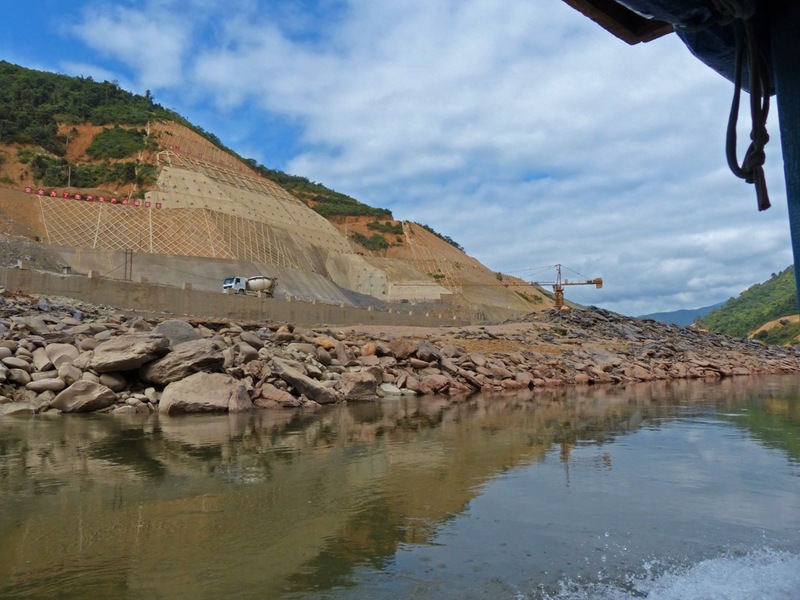 Soon the dam will be completed and the Nam Ou river will change forever. 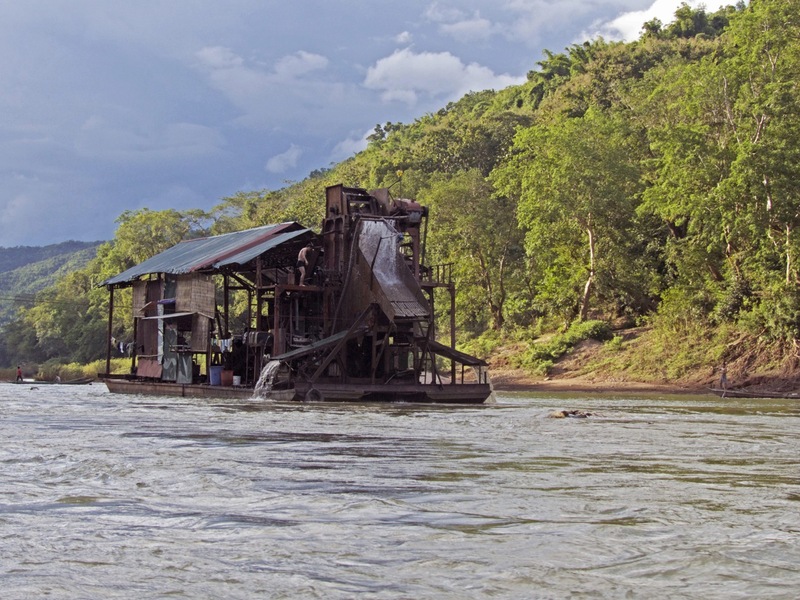 We also passed a few of these iron barges that are used for gold mining. The 3 times we passed this type of equipment I felt like I had momentarily entered a Mad Max film or maybe WaterWorld. 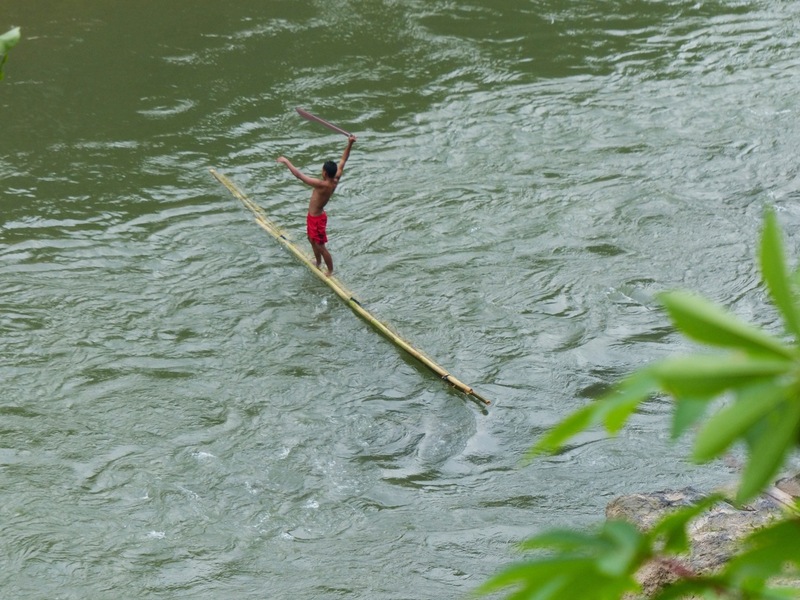 Truly ugly against the natural beauty of the river. The people who live on them are covered with rust and dirt. In the late afternoon our boat ride came to an end. We arrived at the tiny port town of Hat Sa. There is only one guesthouse in town. It was in very poor condition. Everything filthy. The bathroom had no hot water and smelled bad. The beds old and dirty. We pulled out our trusty sheets exhausted after the days ride. We wandered around Hat Sa a bit. Michel had several invitations from local women to photograph their young children. It was not about asking for Kip in exchange for the photograph, which happens too often. I think it was about showing the kids what a camera was and perhaps letting them see a picture of themselves on the view finder. It was Saturday night in Hat Sa and we were definitely the only farang anywhere around. Saturday night is an important night in every Laos town but especially so in Hat Sa. Everyone has worked hard all week and they are ready to have fun. Around 8pm the party began. All the kids came down to the big TV and stereo system in the building below our room. Of course, volume up all the way. Further up the street someone else broke out the karaoke and the shrieking began. 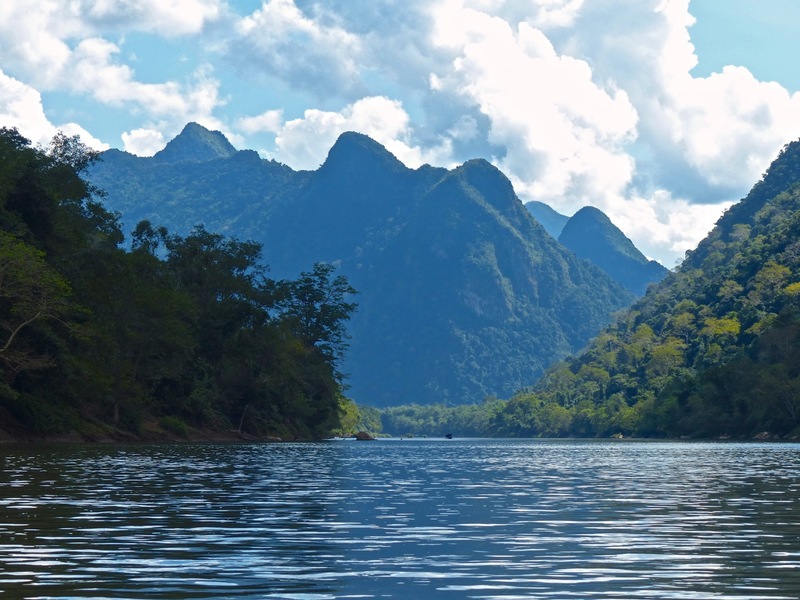 Sorry to say it, but none of the karaoke I have heard in Laos sounds like singing. More like cats mating. We lay in bed almost stunned by the horror of the total chaos outside. Fortunately it did stop around 10:30pm. Then around 4am the common morning greeting of the roosters outside. 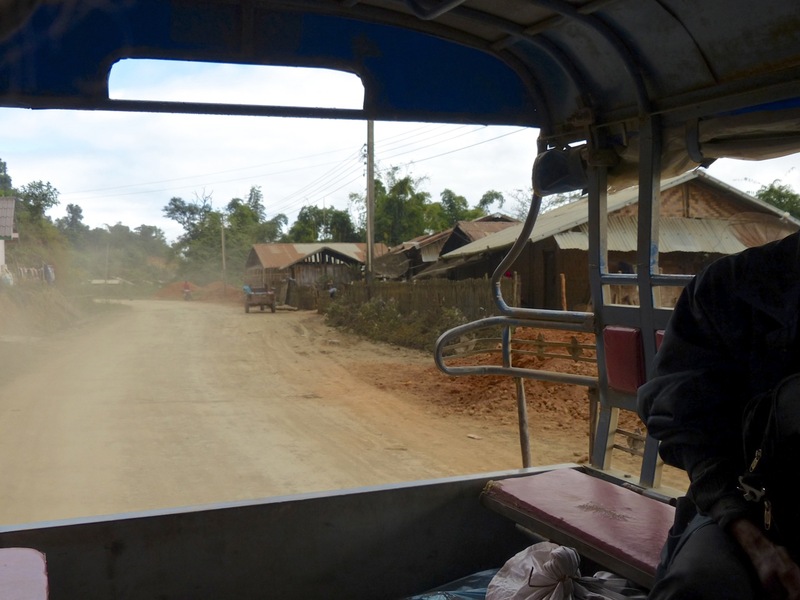 We had been told our ride was coming at 9am, 10am, and 10:30….all in Laos. 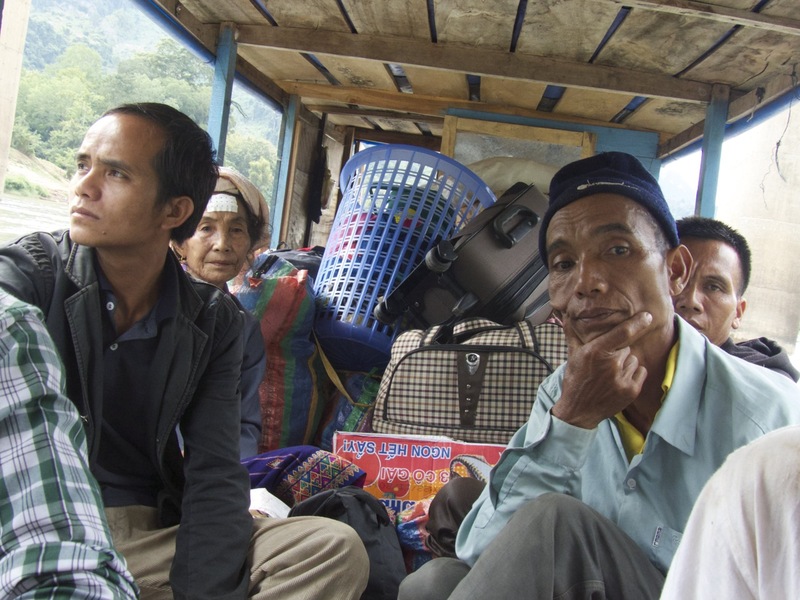 So we packed up early, had some very bad soup, and waited for the songthaew that would take us to the Phongsali the highest city in Laos and almost to the border of China. Hi Claire and Michel, Beautiful pictures. The time on the river sounds wonderful. I am amazed you were able to send this blog and that there is any type of internet communication up there in the more remote area where you are. Sounds like you a roughing it there. I hope you can get some good housing and some real rest along with all the adventure. Safe travels! Great story. 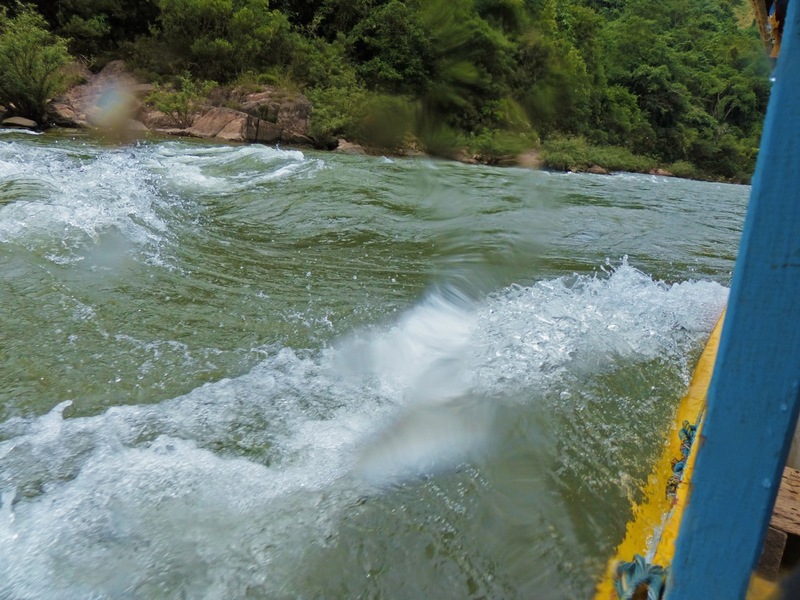 Love the pictures along the river and the rapids look pulse quickening! Sorry to hear Michel has a cold. Luang Prabang should be a nice rest. Thanks! Michel is getting better. Hope you and Jan are doing well. Love the adventure of the trip and the beautiful photographs…you make me feel as if I am there with you! 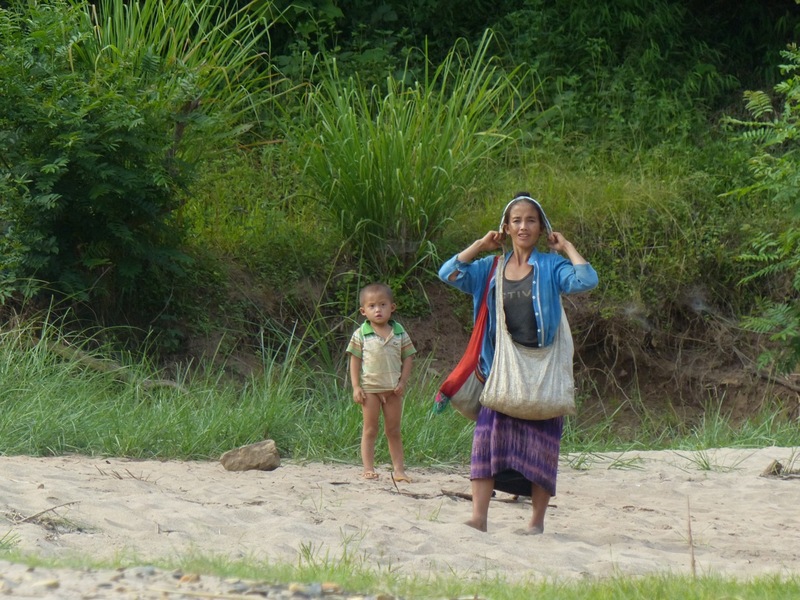 Finally, Muong Noi was still perfect for us, and natural, so we stayed there 6 days instead of 3 ! Now I’m back to France in the cold, enjoy the rest of your trip. It has been a pleasure to meet you both and to have a great diner with you. We enjoyed meeting you as well. We are very happy that you like the blog. Hope to meet you again on the road sometime!